428 backers pledged $18,089 to help bring this project to life. Hi, my name is Harald Geisler. I am a typographer based in Frankfurt am Main, Germany. The Typographic Wall Calendar is a project I've been working on since 2009. The "2012 Typographic Wall Calendar" is a project to produce a large (70cm x 100cm / 27.56in x 39.37in) printed wall calendar for the year 2012. The calendar is made of two-thousand and twelve used keyboard keys. The keys are arranged manually to write out all days of the year 2012. By backing the project with $35 or more, you'll receive an original size print of the calendar. Calendars are shipped from Germany to your home, world wide shipping included. Yes! It is a real, usable calendar. The Typographic Calendar makes finding dates a fun and creative process. 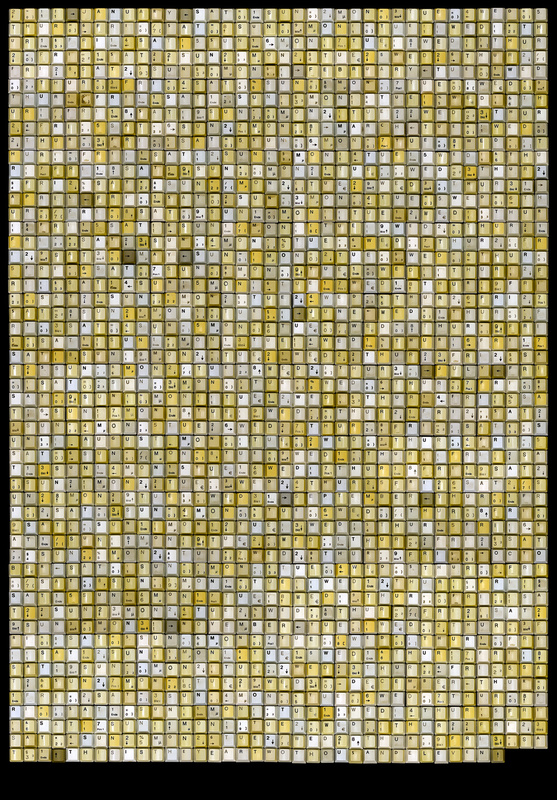 The keys are arranged in a grid. If you read them from left to right, they read each day of the year in sequence: January Sun 01 Mon 02 Tue 03 etc. You can think of it like a long array, sequence or string of all dates in the year. To make things easier, every month is differentiated by an "arrow key." This enables you to scan the grid for a specific month before beginning to search for the day. After a bit of practice, you can orient yourself quickly within the grid. You can also use certain brands of whiteboard markers to write events onto the calendar. The project began in 2009 as a promotional work for my Typographic Studio in Frankfurt am Main, Germany. One week before New Year’s the remaining prints went out to friends and clients. The response was overwhelming. People called up and said that they wanted to buy more or that they had already framed it. In 2010 we decided to turn the project into a Kickstarter campaign →kck.st/20eleven. The response was again very positive. After a successful campaign with 205% funding, we shipped over 90 calendars to people all over the globe. How is the calendar made? First the keyboards have to be broken. 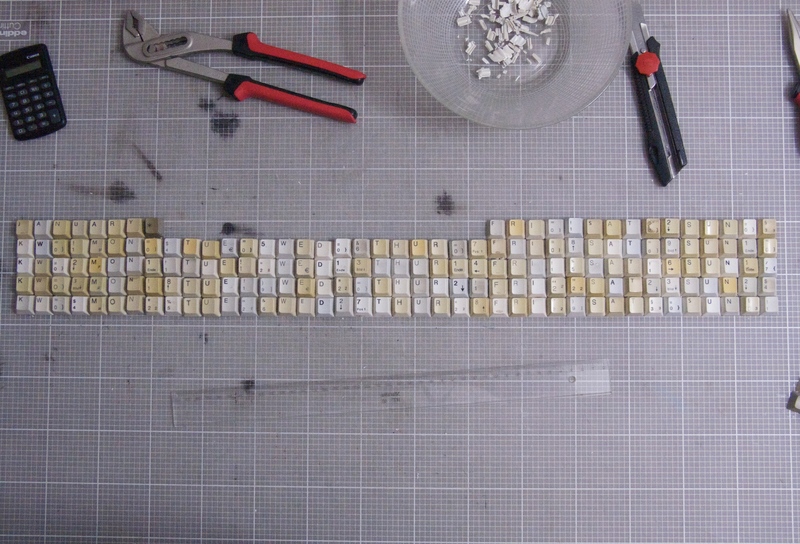 Then the keys are arranged by hand into a grid. To achieve high resolution and minimize lens distortion, the keys are photographed not in a single shot but line-by-line in small groups. The 2010 prototype was a gigantic image of 323 Megapixel (15119 x 21378px, 1,83 GB Photoshop RGB). The printed Typographic Wall Calendar reproduces the keys in their actual size. The size of the print is B0 (70cm x 100cm / 27.56in x 39.37in). It's printed in four color offset on thick paper and UV coated to protect the print from scratches and the colors from bleaching. What does the press say about the Typographic Wall Calendar? On The "On Kawara Edition" or save the date. This reward is a tribute to the japanese artist Kawara On. 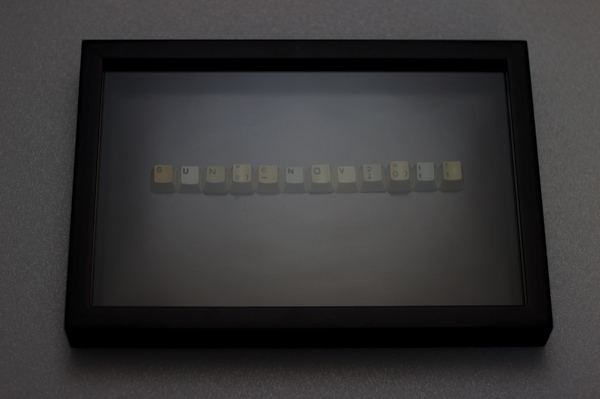 Kawara is internationally renowned for his reduced typographic date paintings. In this picture series, called "Today Series," Kawara painted the picture's creation date on canvas. This was executed in the language and typographic convention of the country the painting was created in. From my first encounter with Kawara's body of work as a teenager, I was very impressed by the meticulously execution and the sheer vastness of the body of work. Kawara traveled a lot and so did his paintings. I was lucky to grow up in Frankfurt am Main with a museum (the MMK - Museum für moderne Kunst) that had acquired quite a few date paintings--even the rare ones that are kept with a newspaper of the pictured day in a card box. During the nineties the museum offered free entry on wednesdays, and Kawara's work was included in almost every exhibition. So I was followed by Kawara's work for a long time, or did I follow it? Despite my interest in archiving time and fascination for the work aesthetically, there was one thing I didn't like about Kawara's work. I couldn't relate to the depicted date. The strategies that I developed to create the Typographic Wall Calendar can also be used to create physical wall mounts of actual keys and particular dates. While preparing this Kickstarter Campaign "2012 Typographic Wall Calendar" I had the idea to allow backers to commission art objects featuring individual dates. A date that was, is or will become important to you personally. Relating my work to my memory of On Kawara's work and to offer a personalized specific artwork, made me very happy. A picture of the design layout is illustrated above. 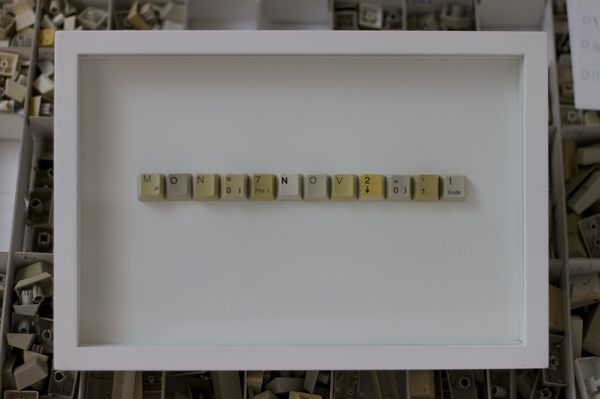 I will then mount and frame these keyboard keys behind glass within a special frame for objects. The Kawara Edition will include both the framed date and the content of "The Private Edition" (a signed 2012 calendar with two additional unsigned copies). After the Kickstarter campaign I will ask you for your date. This commissioned date will be assembled, framed, and shipped to your home with a certificate. A perfect complement to the Typographic Wall Calendar! The size of the arranged keys is 9.25 x 0.7 x 0.4 in. (23,5 x 1,8 x 1 cm) if it is a thursday or 8.6 x 0.7 x 0.4 in. ( 21,8 x 1,8 x 1 cm) with any other day of the week. The campaign deadline is November 6th to ensure that calendars will arrive before the holidays. When the (fingers crossed) funding goal is reached, the calendar assembly will start on Monday November 7th. The print data will be sent to the print shop on November 11th. Prints should be ready by November 16th and shipping starts on the same day. What will happen after the Kickstarter Project? All Kickstarter backers will receive their calendars first. The remaining prints will be sold on my studio's website www.haraldgeisler.com. Maybe a local store will also be selling the calendar here in Frankfurt am Main. We're still looking for venues to display and sell the print. If you like this calendar and run a store drop me a line. Of course by backing this project you will not only get your copy first, but also at a much cheaper price. The backer rewards include world wide shipping from Germany. 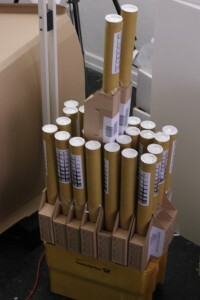 All calendars will be send in a strong protective poster tube as small packets (Päckchen) with DHL. All shipments are covered with an insurance and trackable online. "Päckchen" is the most economical way to ship goods from Germany. That means the posters literally get shipped, on a boat from Germany. From my experience with the 2010 Kickstarter campaign we expect orders to take between one and (in the worst case) six weeks. To secure the safe delivery of the calendar, all shipments are trackable online. Shipments within the EU will most likely not be shipped on a boat, but still can take up to three weeks. Inside Germany shipments take between 2 days and up to a week. Shipments from oversea backers will be shipped first, followed by EU and German backers. Your planing to make the calendar a gift to someone you like? All orders shall arrive before the holidays in December. Shipments of two to five calendars will be packaged in a wider and stronger (8cm/ 3.1inch) diameter poster tube. If you order more than five calendars you'll recieve multiple tubes. Still like to know more? Mike McGregor from the Kickstarter team was so nice to invite me to a creator Q&A at → The Kickstarter Blog. The Single :: You will get one print of the 2012 calendar (70 x 100cm) shipped to your home. World wide shipping included. The Double :: You will get two prints of the 2012 calendar shipped to your home. World wide shipping included. The Triple :: You will get three prints of the 2012 calendar shipped to your home. World wide shipping included. Quadruple? Quintuplet? Yes, it's possible. Add $20 for each additional print. The Private Edition :: This includes a signed 2012 calendar and two additional unsigned prints shipped to your home. As above, world wide shipping included. Add $20 for each additional print. The Kickstarter Collectors Edition :: This includes both the 2011 and 2012 calendar signed on the backside and shipped to your home. World wide shipping included. Add $20 for each additional print. The Gift Edition :: Say goodbye to holiday shopping stress! This includes eight calendars shipped to your home or company address. The prints are packaged securely as eight individual poster tubes mailed together in a single box. World wide priority shipping included. The Retail Pack :: This includes 15 calendars shipped to your home or company address. The prints are packaged in three poster tubes. World wide priority shipping included. Add $55 for each additional packs of five prints. The Museum Edition :: This includes all three Typographic Wall Calendars. Receive the 2010, 2011, and 2012 calendars signed on the backside. World wide shipping included. Add $20 for each additional unsigned 2012 print. 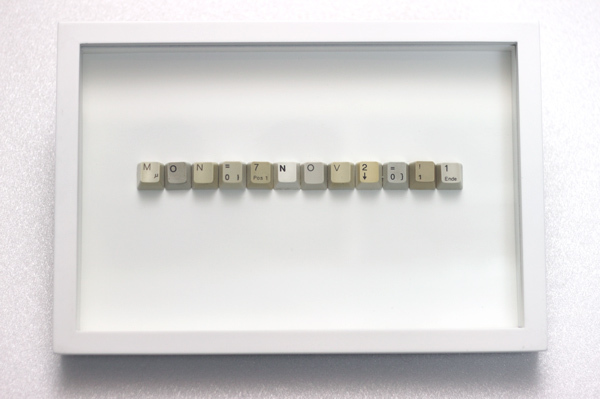 On Kawara Edition :: This special edition includes an individually made art object -- a date of your choice set in keyboard keys and mounted in a frame. For details refer to the project description on the left. The Kawara Edition also includes a signed certificate and the content of The Private Edition (one signed and two unsigned calendars). World wide priority shipping included.